The bombardment of disenchanting news in the media about Sierra Leone can be discouraging for tourists desiring an African vacation by making them think that any news coming from this war-torn nation is all doom and gloom. Can anything good come out of Sierra Leone? Be my guest, come and find out for yourself. Tourism is a gold mine in Sierra Leone that provides a big chunk of revenue in the form of foreign exchange for the government and local businesses. The potential for the growth of Sierra Leone's tourist industry is both promising and exciting. This natural paradise is as exotic and inviting as its warm, friendly people, their culture and the numerous, potentially enchanting beaches in this tourist haven that remain unknown to most Westerners. The weather compliments an azure sky that romances the Atlantic sea breeze whispering through palm and coconut trees, while the humidity relaxes one's body with a cool and soothing effect. The climate allows for the growth of all tropical crops or fruit trees, a necessary source of daily fiber in a healthy diet. Fruit trees usually bloom in most backyards or along the route leading to the beaches. It is a warm, romantic experience to pluck juicy mangoes or sweet oranges from the trees, stimulating one's taste buds. Unlike some other war-torn countries, Sierra Leone is incessantly striving to get back on its feet to walk unaided. Although its challenges are multifaceted, the United Nations has given the country high grades for having emerged from a harrowing decade-long civil war and refusing to be called a failed state, instead charting out a path to recovery and rehabilitation. Debt relief for Sierra Leone has increased in volume and intensity from Western countries and international agencies; progress appears ongoing. Religious tolerance flourishes in Sierra Leone. There are many religious and indigenous beliefs, which people practice without fear or prejudice. Sierra Leone is situated on the west coast of Africa, flanked by the Republic of Guinea on the north and Liberia on the east and northeast. The Atlantic Ocean borders the west and south, stretching about 300 miles along the coastline. The nation is endowed with a tropical climate, which is divided into two prime seasons — the dry season extends from November to April and is the best time to plan a vacation or visit. The rainy season is from May to October. December to February is the Harmattan period when the dry wind from the Sahara desert transports cool temperatures inland. If you can't take a little chill you might need a spring jacket during this period. There is only one international airport in Sierra Leone — Lungi International Airport, which is separated from Freetown by the Sierra Leone River. It takes 30 to 45 minutes to ferry across the river to Kissy Dockyard. The trip can be slow, or sometimes a ferry might break down from overuse or inadequate maintenance. Helicopter and hovercraft services are also available — it takes about seven minutes to fly from the airport to Freetown. Most tourists prefer to be taxied by hovercraft or helicopter service that takes them directly to the hotels along the beaches. 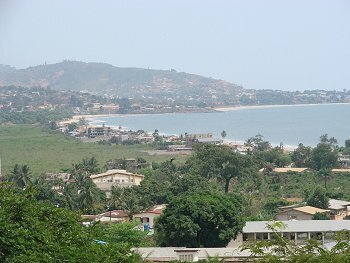 About a dozen seductive beaches are strategically scattered along the coastline in the capital city, Freetown. These include: Lumley, Goderich, Lakka, Mammah, Number 2 River, Tokeh, Hamilton, Kent, Sussex, York, John Obey and Bureh. Hotels are located in close proximity to the beaches, usually within walking distance. Nature is alive and well here, jumping and dancing right in your face. You just cannot resist the charm or spiritual healing that the beaches offer. It is no secret that visitors to the country consider the beaches indispensable. The beating waves and fresh air coupled with the wonderful people are an unbeatable combination. Bintumani Hotel sits on a vantage gradient overlooking the ocean. It's the largest and most modern hotel in Freetown, with Internet services in every room along with satellite television — popular channels like CNN or ESPN are readily available. Services are priced in U.S. dollars. Internet cafes are located along the beaches, where one can easily contact friends or family online. Foreign exchange transactions can be completed on-site. One can cool down from the alluring sunshine in the hotel's swimming pool or just walk from one's room to the gorgeous free beach. Other hotels include Sierra Light House, Cape Sierra, Kumbima and Barmoi. There is a bargain to suit every budget. Booking a hotel room can be done online. Prices range from $80.00 to $130.00 per day. The hotels serve a variety of cuisines in the cafeteria or restaurant. Tourists never experience a short supply of entertainment at a hotel. A resident band provides local and western music two or three times a week, including seasonal festivals. Taking a panoramic view from one's hotel balcony is as romantic as it is refreshing. Viewing the waves roar or inhaling the soothing Atlantic sea breeze feels satisfying and mind-enhancing. There is no better way to spend a stress-free vacation away from the hustle and bustle so prevalent in Western lifestyles. A maiden trip to the beach is like feasting on a delicacy that you wish would last forever. There are several beach huts for rent that can accommodate a group of people and protect their belongings. The sparkling white sand is enticing to play on. Going to the beach has become a ritual for people living in or visiting Sierra Leone. Some religious groups go to the beach early in the morning to tap its serenity or practice meditation. Baptism, fasting and prayers are conducted on the beach early in the morning or late at night. There's a belief that divine providence inhabits the beach, listening to and answering the genuine requests of people for direction or provision. Fishing provides a lot of fun both as a recreation and a commercial activity. There are no restrictions except that the use of explosives is forbidden. Fishing is a trade that provides a source of livelihood for some people. A fisherman toils with his chain-crafted net, mending and checking it daily to stay on top of his game. He owns a canoe that he ferries deep into the ocean to cast his wide net. He's more intuitive than he is cerebral in choosing the spot where to cast his net. At the opportune time he gets helpers to help pull the net. The story of Jesus and the Fishermen soon crosses one's mind. The chain could be heavy to pull and would need additional strong men and women to complete the task. When the catch arrives there is a smile on everyone's face. Fishmongers are ready to collect and haggle for the catch. Kingfisher birds too claim their own share. There is enough for the parties. Fish is part of the daily diet in Sierra Leone and provides the cheapest source of protein. Bystanders enjoy the fun and make new friends. Peddlers are actively pushing their wares. Women carry fruit trays or snacks. Children usually long for the opportunity to meet potential friends and try to form a bond with them — some request adoption or sponsorship to go abroad, where they believe their destiny would change. The children are genuine, very open and ready to tell their life stories. The value and thirst for education is very important to them. English is the formal language, though Krio is the lingua franca, a kind of broken English. It's quick to pick up if only one listens carefully. Tourists are treated with warmth and courtesy. They would never hear someone say that a visitor has an accent. This derogatory use of the word happens in the West when referring to an alien or immigrant. In a fast-paced society patience is in short supply. Here, life seems laid back and folks have the luxury of time. There is enough to learn and enjoy, invariably a firsthand education is humanizing and helps visitors to appreciate other people and their culture. This refreshing experience is life changing. Movies and books only tell a small part of a broader and more complex picture. Tourists often expect to bond with the crime scene that the well-known movie "Blood Diamonds" featured — a purely commercial fiction that was not filmed in Sierra Leone, though it created more global awareness. Sierra Leone and the war victims could certainly have benefited from the cash flow invested elsewhere to stage the movie.